It's okay if you forgot National Fudge Day on June 16. Forgive your sweet tooth and read our full review of John Kelly Fudge, our favorite. It’s even kosher! Perfect for yourself or for gifts. Save 10% through June 30. Enter code Nibble at checkout. Read our review or go directly to HeavenlySouffle.com. Make a delicious, low-calorie fruit soup by puréeing 2 pounds of cantaloupe (two melons—reserve some melon balls for garnish). Then add 3/4 cup of herbal fruit tea and 1 to 2 tablespoons of lime juice. Garnish with chopped mint and melon balls or berries. Enjoy it at any meal as a first course or dessert, or anytime as a snack. For protein, add fat-free plain yogurt, which you can sweeten with a no-cal sweetener. If the cantaloupe isn’t sweet enough, add a small amount of sweetener to the soup, too. This is one of our favorite diet treats! Click here for other low-calorie foods. In our May issue, we previewed savory Father’s Day gift ideas. This month, we’ve added sweet gifts for Father’s Day. We have a special cake recipe for Dad that you can serve with a glass of Cabernet: Chocolate Cabernet Flavors Di ‘Vine’ Wine Cake. It was the national winner of last year’s Bundt’s Across America contest. Read it and see how you can enter this year’s contest. June is National Candy Month: You can be certain that we’ve recommended some of our favorites. 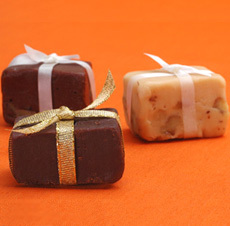 June 16th is National Fudge Day, so you can read the brief History of Fudge and see the original recipes. It’s also National Dairy Month and National Seafood Month. See our reviews in the Table of Contents below, and read about dozens more food holidays.